If you need to replace your Maytag fridge water filter then look no further. All of our Maytag fridge water filters are genuine, brand new and sealed in the manufacturer's packaging. 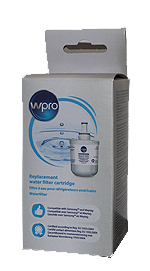 We hold stock of all types of Maytag's water filters for all models of Maytag fridge freezer. If you are at all unsure which Maytag water filter you need, please call us on 01276 489571 and we will do our best to help. For cleaner, fresher water and ice, the newly designed Maytag PUR UKF8001 fridge water filter, also known as the PuriClean II UKF8001AXX fridge water filter ensures the highest quality water and ice for you and your family. The PUR UKF8001 or PuriClean II UKF8001AXX fits Maytag models with a long cylinder 'drop down' compartment in the top, right hand side of the fridge, which is easy to reach for quick and efficient replacment. This genuine Maytag Cassinetta SBS005 - 480181700134 - clean ice and water filter fits all Maytag fridge freezers manufactured with the water filter located in the base grille under the doors. It is recommended that the filter be replaced at least every 6 months or 1500 litres. The Maytag PUR UKF7003 or PuriClean UKF7003AXX fridge water filter provides the highest quality water and ice for you and your family right from the refrigerator door. The quick change design allows easy replacement of your Maytag PuirClean water filter without tools, spills or mess. The Maytag PUR UKF7003 or PuriClean UKF7003AXX water filter fits Maytag & Jenn-Air refrigerators with a round, screw-in filter located inside the refrigerator compartment above the top shelf. 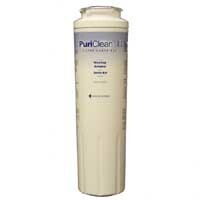 The PuriClean III UKF9001AXX water filter is now no longer available. The PuriClean II UKF8001AXX has been updated and is now known as the PUR UKF8001. If you have used the UKF9001AXX fridge water filter before, the PUR UKF8001 or PuriClean II UKF8001AXX is a suitable updated replacement water filter.